This casual power reclining sofa is a great way to update your living room or family with a comfy place to rest. 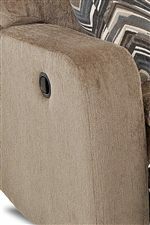 This sofa has a split seat back with a separated headrest and padded chaise seat. With a power recline mechanism, this sofa allows you to recline with just the touch of a button. The straight and wide track arms on either side give the piece a clean look while the foam cushions and padded seats give you a comfortable sit. Use this power reclining sofa to create a great place to relax in your home. 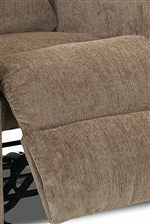 The Bradford Casual Power Reclining Sofa by Klaussner at AHFA in the area. Product availability may vary. Contact us for the most current availability on this product. Leg or Skirt No visible base or skirt.